It probably starts during the long Thanksgiving weekend. You might not want to go shopping and deal with those crazed early bargain hunters, so after a leisurely breakfast, you make your way out to the garage or basement. Down from the shelves come the dusty boxes of Christmas decorations, the outdoor lights, and tree ornaments. Instinctively, you know another year has passed; and less of your family and friends are around than the year before. It’s a bittersweet time. Your wide-eyed childhood wonder got replaced long ago with reality, and the serious side of life. Despite these momentary negative feelings, you have every intention of getting some decorating work done; but the old memories are going to stop you, and there is nothing you can do about it. Opening the aged cardboard containers, your eyes begin the journey as they come to rest upon a rather colorful and unusual summation of your life. You put this stuff away in a huff last year, eager to get the New Year underway, and now it’s time to reflect again. There…..that old nicked and battered tree ornament. It’s from the first tree you and your wife had—the year you were married. That fellow has seen a lot of action including three roughhousing kids, managing to survive all these years. 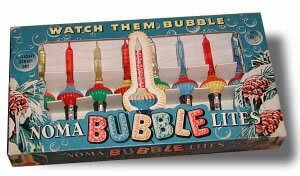 Ooohh, there are the old bubble lights your dad handed down to you, still in the original box. Wiring is starting to dry out and could crack. They have got to go up this year. Better use them before we lose them. Trains, the trains…..where did you put them? That old Lionel set. Where did you store them? They are worth a mint today! Baby Tommy will go bonkers when he sees them. Hope we have some smoke pellets left. Your mind faithfully recreates the sound of toy trains rumbling over a big sheet of plywood in the old basement—Skippy sitting there and barking whenever you sounded the whistle. Where are the crocheted snowflakes mom made for you, one for each of you kids, and for your kids too? She will come back and haunt you for the rest of your life if you lost them. You chuckle when you remember just how persistent she could be. Ah….there they are. Now the memories come of that blue, two-and-a-half story house you lived in, over in the Roseville Avenue section of Newark, not far from Bloomfield Avenue. Streets clogged with Holiday snow, houses ablaze with those big Christmas bulbs of many colors. Big packages going into every house, lugged up the steps and back down for more. How colorful St. Francis Church looked with all the flowers and poinsettias on the altar. You can hear the choir, packed full, with yourself singing in your first tenor voice—(grin) couldn’t do that today without hurting yourself. High Mass with Monsignor Dooling in charge! Better not mess up today or you might not see New Years!!! Smell those delicious things cooking in mom’s kitchen….apple pie, artichokes, escarole soup, manicotti, fish, and meatballs…..glorious meatballs… your absolute favorite. Nobody made meatballs like your mom. And for dessert at Christmas dinner…..chocolates, nuts, cake, and all the cookies your aunts and uncles brought. Lots of talk and parents telling those funny stories about growing up in neighborhoods not so very far from where you were sitting. You cringe a bit at your first sip of whiskey, a whiskey sour whose remembered taste still puckers your mouth. Booze don’t taste too bad now, you chuckle to yourself. You laugh as you stumble across that old color wheel from a long-gone Christmas tree. Dad must have packed this away years ago. How garish it looks now, but it was hot stuff back in the 60s. Trees made of silver or white fluffy stuff that reflected the revolving light. Ugh!! You shudder, but remember the great gifts you got under that funny tree, including a transistor radio, a baseball glove, and your first kiss. Wonder where that girl is now, you muse. Does she remember? What’s in this old bag? Paper chains for the tree! Where did they come from? There on the last chain is your baby daughter’s name. She must have made them in first grade. Better be careful, they are over 30 years old. How did you miss these last year? As you think about hanging the fragile chain over the dining room entrance, you are transported back to Abington Avenue School. Mrs. Williams is showing your first grade class how to make those paper chains out of colored strips of construction paper. That’s right, loop them through each other and paste them. Alternate the colors, and let it all dry real good before you try to stretch the chain out. Maybe your daughter might like to have it back? You should give it to her as a wrapped gift! You laugh out loud as you remember tasting the school paste. Remember how exciting that last day of school was before Christmas vacation? Singing in the auditorium with the big tree on stage all lit up. The smell of that pine tree seemed to be everywhere. The Christmas play was always a big event. Everyone was smiling and happy. Later you got your turn in the classroom grab bag, and then you all enjoyed a little party in class. On it goes for the remainder of the morning, little surprises and vivid memories one after another, until you realize that those Christmas tree decorations are a living testimony to the people you love and the city you remember fondly. When you put that tree up every year, you don’t just mark time. You celebrate life. Pieces of your tree will become vital parts of your children and grand children’s trees. We live on through a simple green tree. Your wife calls you for lunch. She tells you the weatherman says it could snow heavy if the big storm takes a turn; and the weather pattern is shaping up for a snowy December. You hear her all right, but your mind is racing. Where is Joey’s old sled? Baby Joey would love it. Merry Christmas everyone, and you too Old Newark.